I joined NVIDIA around SIGGRAPH, just as the RTX hardware for ray tracing was announced. I saw the demos, heard the stats, but these didn’t mean a lot to me without hands-on experience. Figure 1. This is what people typically think of when they think of ray tracing. The “One Weekend” demo is fine, but the hemispherical light source and lack of denoising makes it noisy when you move through the scene. You can crank up the eye rays per pixel to around 10 and still get about 30 FPS. But, it’s still a bit noisy and, well, it’s “just” 433 spheres. I decided to see how far I could push the system before it broke. 30-odd years ago I made a ray tracing benchmark suite, the Standard Procedural Databases (called that mostly so I could use the acronym SPD). 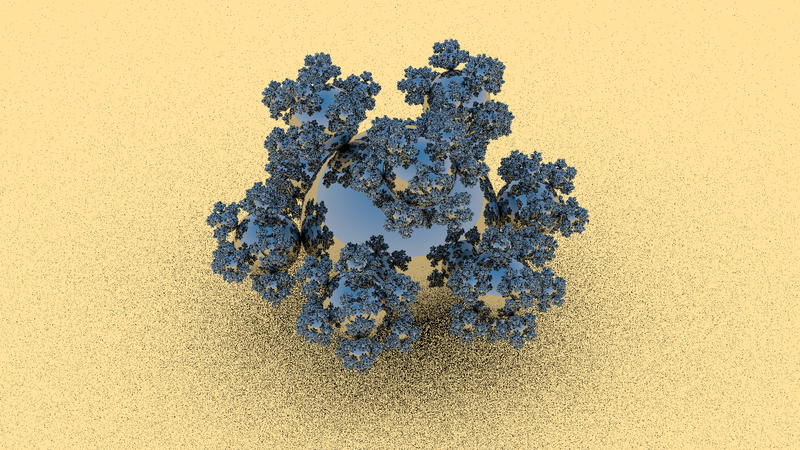 I created one model I dubbed “sphereflake.” It is sort of a 3D Koch snowflake, a fractal curve that defines a shape with a finite area but infinite perimeter. Similarly, at each level of the sphereflake, the radius of the spheres is a third of that of the parent sphere. With nine children for each parent, each new level of recursion adds in the same amount of surface area as the level before. This makes for a model that, taken to its limit, has a finite volume (1.5 times that of the initial sphere) and an infinite surface area. The material model is simpler than that used in Chris’s and Pete’s tutorial scene: just a diffuse plane (which we all fake with a giant sphere) and reflective spheres. Figure 2. Sphereflake with a hemispherical light source, not yet converged. The huge area light causes noise, since a single shadow ray is shot at each ground location in a random direction. Some rays hit the sphereflake, causing a shadow. 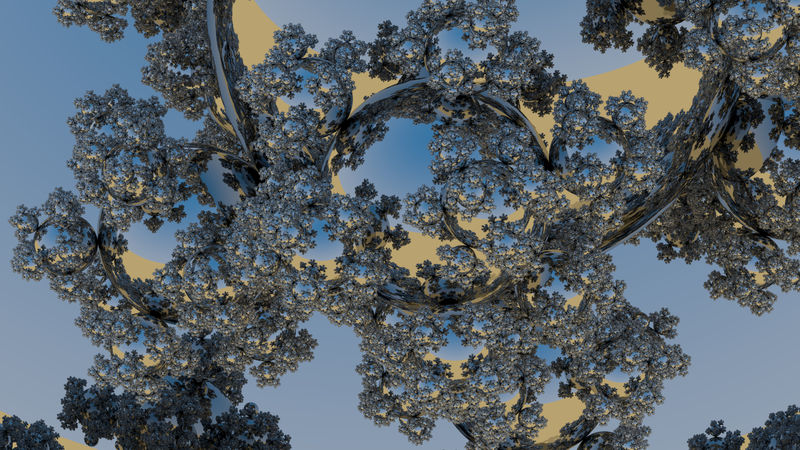 The reflections look good, and it’s enough to go 5 levels deep (spheres reflecting spheres reflecting…). 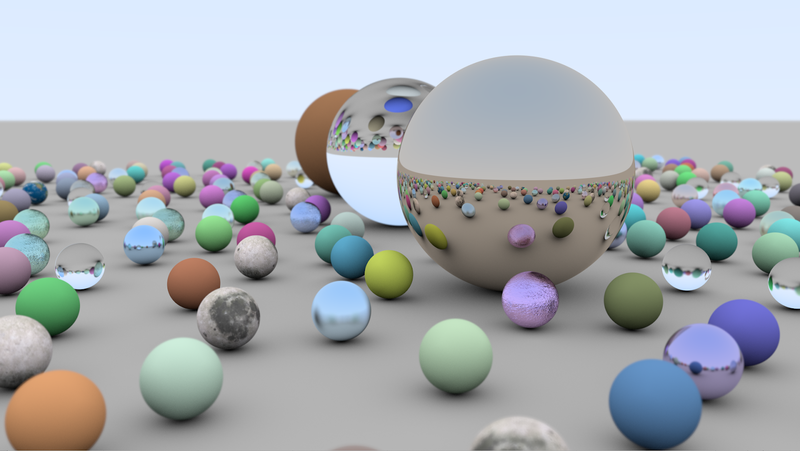 Also, and this was the first “Wow!” moment for me, I could push the procedural model creator up to 8 levels, meaning that we’re rendering 48 million (48,427,562 exactly, since you asked) spheres. Level 9, 436 million spheres, is outside the range for a single Titan V or RTX 2080 Ti. However, I created a separate object for each sphere. Steve Parker pointed out that I could use instancing, which should conservatively give me 20.8 trillion spheres. Maybe I’ll try this next week, though realistically the scene already has a ratio of 24 spheres per pixel right now and the smallest spheres are mostly twinkly noise when I move through the scene. NVIDIA’s CEO likes to quote 10 GigaRays/sec for Turing. Me, I like to quote 48 million spheres. And don’t even think about how many triangles that would be if tessellated and rasterized, not to mention forget about local reflections. Note that all rendering here is pure ray tracing throughout. Most of Chris’s tutorials use rasterization for the initial eye rays, as rasterizing these can normally beat ray tracing for performance. Not so for scenes with custom primitives such as spheres. Those shadows are sharp while moving around, not noisy. For this view I get about 60 FPS – lower than before, since I’m shooting three shadow rays instead of just the random one for the hemispherical light. If I zoom in, so that everything is reflecting and spawning a lot of reflection rays (and fewer shadow rays, as I don’t compute shadows for entirely reflective surfaces), it drops to no lower than 30 FPS. While a bad year for Winston Smith, 1984 was a great year for graphics. For example, that year saw the introduction of Radiosity. Pixar had a bunch of wonderful papers, including one by Rob Cook and all on what they called “distributed ray tracing” (and that everyone else eventually called “stochastic ray tracing”). The idea is simple: shoot more rays to approximate the effect of the material, light, motion, depth of field, etc. For example, to get soft shadows, shoot shadow rays towards random locations on an area light and average the results. before computing isVisible in the previous code snippet. Most of my work was on getCircularAreaSample, which I derived from the hemispherical light’s getCosHemisphereSample subroutine, using a radius for the directional light’s area. The images seen here are the results after a few seconds of convergence. The softer the shadow, the more rays that need to be fired, since the initial result is noisy (that said, researchers are looking for more efficient techniques for shadows). I did not have access in these demos to denoisers. Denoising is key for interactive applications using any effects that need multiple rays and so create noise. What impressed me about adding soft shadows is how trivial it was to do. There have been dozens of papers about creating soft shadows with a rasterizer, usually involving clever sampling and filtering approximations, and few if any of them being physically accurate and bullet-proof. Adding one of these systems to a traditional renderer can be person-months of labor, along with any learning curve for artists understanding how to work with its limitations. Here, I just changed a few lines of code and done. The shadows here are actually hard-edged again, but the depth of field effect blurs the distant one in particular, along with the ground texture. 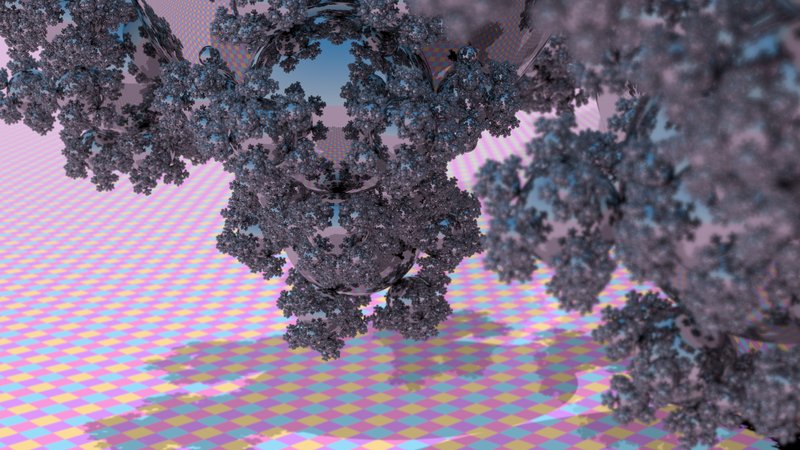 Adding some effects to a ray tracer is dead simple, and addictive. For example, I’ve held myself back from adding glossy reflections; perhaps you want to add these yourself? 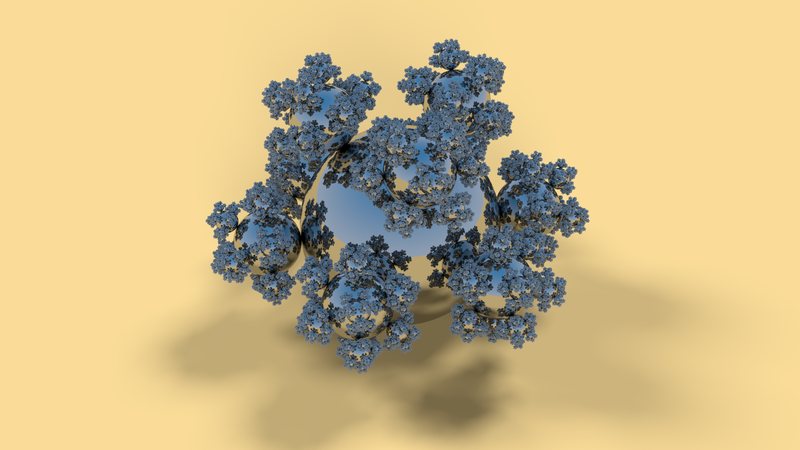 As for me, I began collecting ray tracing related links again, after a eight-year hiatus from publishing the Ray Tracing News. If you recently got a Turing-based card, you can grab the code here. You can try toying with the shaders or making entirely new demos. These tutorial programs are built atop Falcor and are focused on letting you modify shaders. After decades of lock-step Z-buffer rendering, being able to take arbitrary numbers of samples in arbitrary directions is wonderfully liberating. The interactivity and ability to handle a huge amount of geometry is still sinking in.